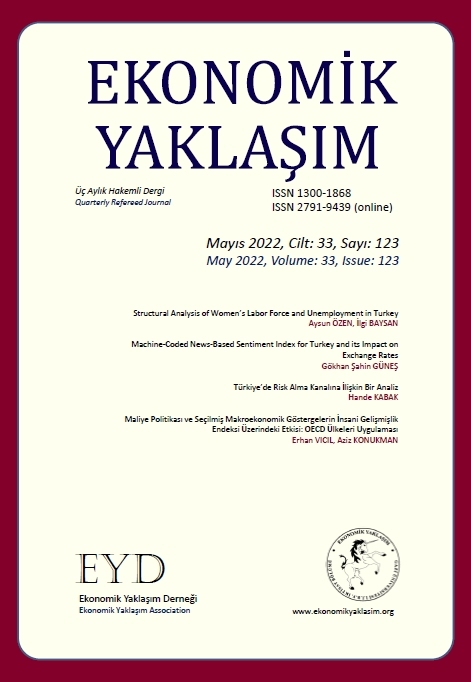 The fundamental aim of this paper is to explore the empirical relationship between employment and economic growth in Turkey over the period 1995Q1-2007Q4 by using modern time series techniques. The employment growth performance is a concern for Turkey as its employment rate is well below any European Union (EU) member country. Some authors have argued that the rates of employment growth in Turkey have remained low over the same period despite relatively strong economic growth. The results of cointegration tests indicate the existence of a long-run relationship between the real GDP and employment. An estimate of employment elasticity of economic growth is obtained by applying the method of least squares over the period 1995Q1-2007Q4. The estimation of employment elasticity has yielded a value of 0.20, indicating a positive functional relationship between employment and output. The results of Granger causality tests reveal that there exists a bi-causality relationship between real GDP and employment in the case of Turkey. Key words: Employment, Economic Growth, Employment Policy, Employment Intensity of Growth, Cointegration. JEL Classification: J2, O4. Bu çalışmanın temel amacı modern zaman serisi tekniklerini kullanarak Türkiyede istihdam ve iktisadi büyüme arasındaki ampirik ilişkiyi 1995Q1-2007Q4 dönemi için incelemektir. İstihdam büyüme performansı Türkiye için bir endişe kaynağıdır çünkü istihdam oranı herhangi bir Avrupa Birliği (AB) üyesi ülkenin çok altındadır. Bazı yazarlar göreli olarak güçlü iktisadi büyüme olgusuna rağmen, istihdam büyüme oranlarının ilgili dönemde düşük kaldığını ileri sürmüşlerdir. Koentegrasyon testleri sonuçları reel GSİYH ile istihdam arasında bir uzun-dönem ilişkisinin varlığını göstermektedir. İktisadi büyümenin istihdam esnekliği en küçük kareler yöntemi ile 1995Q1-2007Q4 dönemi için tahmin edilmiştir. İstihdam esnekliğinin tahmini olarak 0.20 değeri bulunmuştur ve bu istihdam ile output arasında pozitif fonksiyonel bir ilişkinin varlığını göstermektedir. Granger nedensellik testleri Türkiye örneğinde reel GSYİH ile istihdam arasında çift-yönlü nedensellik ilişkisinin bulunduğunu ortaya koymaktadır. BOLTHO, A. and GLYN, A. (1995) &#8220;Can Macroeconomic Policies Raise Employment?&#8221; International Labor Review,Vol. 134, No. 4-5, 451-470. ENGLE, R.F. and GRANGER, C.W.G. (1987) &#8220;Co-integration and Error Correction Representation, Estimation and Testing.&#8221; EconometricaVol. 55, No. 2, 251-276. ERCAN, H. and TANSEL, A. (2006) &#8220;How to Approach the Challenge of Reconciling Labor Flexibility with Job Security and Social Cohesion in Turkey.&#8221; paper of the Turkish experts group&#8217;s preparation for European Council&#8217;s FORUM 2005 (Strasbourg). GRANGER, C.W.J. (1969) &#8220;Investigating Casual Relations by Econometric Models and Cross-Spectral Methods.&#8221; Econometrica, Vol. 37, No. 3, 424-438. HEINTZ, J. (2006) &#8220;Globalization, Economic Policy and Employment: Poverty and Gender Implications.&#8221; Employment Strategy Papers, Employment Policy Unit, Employment Strategy Department, Geneva: ILO. ISLAM, R. (2004) &#8220;The Nexus of Growth, Employment, and Poverty Reduction: An Empirical Analysis.&#8221; Recovery and Reconstruction Department, Geneva: International Labor Office. JOHANSEN, S. (1988) &#8220;Statistical Analysis of Cointegration Vectors.&#8221; Journal of Economic Dynamics and Control, Vol. 12, No. 2-3, 231-54. KAPSOS, S. (2005) &#8220;The Employment Intensity of Growth: Trends and Macroeconomic Determinants.&#8221; Employment Strategy Papers,No.2005/12, Employment Strategy Department, Geneva: ILO. KHAN, A. R. (2007) &#8220;Asian Experience on Growth, Employment, and Poverty: An Overview with Special Reference tothe Findings of Some Recent Case Studies.&#8221; UNDP Regional Centre in Colombo and International Labor Office, Geneva. LAWSON, R. and BÃERHANZL, E. (2004) Labor Market Flexibility: An Index Approach to Cross-Country Comparisons , Journal of Labor Research, Vol. 15, No.1, 117-126. PADALINO, S. and VIVARELLI, M. (1997) &#8220;The Employment Intensity of Economic Growth in the G-7 Countries.&#8221; International Labor Review136: 191-213. PAMUKCU, T. and YELDAN, E. (2005) &#8220;Country Profile: Turkey, Public Sector and Fiscal Policy Issues.&#8221; report prepared for the Economic Research Forum. PIACENTINI, P. and PINI, P.(2000) &#8220;Growth and Employment.&#8221; In Vivarelli, M. and M. Pianta (Eds. ), The Employment Impact of Innovation: Evidence and Policy(44-76). Routledge: London. OECD (2000) Recent LabourMarket Performance and Structural Reforms, OECD Economic Outlook, Part VII. OECD (2009) OECD-Economic Outlook, no.54, November. OECD (2010) OECD-Employment Outlook, Statistical Annex. OSMANI, S. R. (2004) &#8220;The Employment Nexus Between Growth and Poverty: An Asian Perspective.&#8221; (mimeo), Report prepared for the Swedish International Development. SAYGILI, S. and CIHAN, C. (2008) &#8220;Turkiye Ekonomisinin Buyume Dinamikleri: 1987-2007 Doneminde Buyumenin Kaynaklari, Temel Sorunlar ve Potansiyel Buyume Orani.&#8221; (The Growth Dynamics of the Turkish Economy: Sources of Growth, Fundamental Problems, and Potential Rateof Growth). TUSIAD ve T.C. Merkez Bankasi, Publication No.TUSIADT/2008-06/462. SEYFRIED, W. (2005) &#8220;The Relationship between Employment and Economic Growth in the Ten Largest States.&#8221; Southwestern Economic ReviewSpring, 13-24. TAYMAZ, E. and OZLER, S. (2003) Labour Market Policies and EU Accession: Problems and Prospects for Turkey, Conference on TURKEY: Towards EU Accession, Bilkent University, Ankara. TELLI, C., VOYVODA, E. and Yeldan, E. (2006) &#8220;Modeling General Equilibrium for Socially Responsible Macroeconomics: Seeking for the Alternatives to Fight Jobless Growth in Turkey.&#8221; METU Studies in Development, Vol. 33, No. 2, 255-293. TUNALI, I. (2003) &#8220;Background Study on the Labour Market and Employment in Turkey.&#8221; prepared for the European Training Foundation. YELDAN, E. (2006) &#8220;Neo-Liberal Global Remedies: From Speculative-led Growth to IMF-led Crisis in Turkey.&#8221; Review of Radical Political Economics, Vol. 38, No. 2, 193-213. WALTERSKIRCHEN, E. (1999) &#8220;The Relationship between Growth, Employment and Unemployment in the EU.&#8221; European Economist for an Alternative Economic Policy Workshop, Barcelona, Spain. WORLD BANK (2006) &#8220;Turkey: Labor Market Study.&#8221; Report No. 33254-TR, Poverty Reduction and Economic Management Unit, Europe and Central Asia Region, World Bank. Bulletin of Economic Research 2015; 67(3): 265. New perspect. Turk. 2012; 47(): 11.